… and the elves left us a prezzie for baking and cooking!!! One thing I know, is that my divine chocolate cake is going to be much easier in this baby, so it will be making an appearance on the blog in the near future. 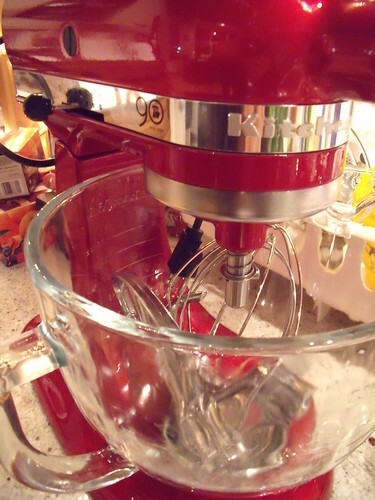 So now I get to research recipes that use stand mixers (instead of ignoring them), and pick which recipe is worthy of breaking in the mixer! Suggestions MORE than welcome for your favourite recipes! Maybe Christmas cookies? HOORAY!! Lots of yummy things will be spinning outta that badboy. We LOVE ours! Oooh! Red. Mine is plain ole white. But I love it and use it constantly. Love your blog. iw. Thanks Isobel, for the kind words! I’m loving the red – it fits in with my red/orange kitchen! Can’t wait to take it for a test spin… I think I’ll be hooked as soon as I get going! Ooooh….beautiful baby! Going to see a lot of mouth-watering bakes from you soon. I’m waiting! Yay for you!!! So exciting 🙂 I love my stand mixer.